I woke up this morning to the sounds of Mayfair Dad grumbling through cold-like snuffles about how icy our snow-covered, ungritted cul-de-sac looked and how unlikely it was we’d be going anywhere in the car today, given the forecast last night was for a further 6cm of snow in London. I then checked my phone for signs of any delays or cancellation of our grocery order this morning. Nothing. I then checked the BBC for the weather, only to have to wade through no fewer than half a dozen headline articles on how clearly useless everyone is in the UK in the face of a bit of snow, most of which seemed to mention how many flights British Airways had cancelled at Heathrow in the past two days. Now, I know how inconvenient it is when travel plans are disrupted. It is tedious and boring and in this weather, probably rather cold and uncomfortable! God forbid it should EVER happen to us with Little Chap to amuse and keep tabs on simultaneously. BUT I cannot help feeling our media are letting down BA, one of our country’s biggest exports. BA fly the flag for Great Britain as they run scheduled flights on time and with no mishap for most of the year, flying business people safely home to their families and holidaymakers to their dreams. Yet, when the busiest airport IN THE WORLD gets snow and the airport authority (NOT British Airways) decides that to keep planes flying at full capacity (i.e.more flights per hour than any other airport in the northern hemisphere, snow or otherwise), they would be RISKING LIVES, the press turns on them all. BAA are clearly over reacting if you believe what you read – the little airports in Stockholm etc are still operating full capacity (nothing like Heathrow’s), as are many of the rest of the UK’s far smaller airports. Then they turn on BA for letting passengers down, when they are only one of all the airlines operating under BAA’s jurisdiction at Heathrow and have ONLY cut 20% of flights. It just happens that 20% of their flights from Heathrow is equivalent to a far smaller number of flights for any other airline, as they are the local, host carrier. So come on British Press. Don’t be so hypocritical. Remember those glory articles you wrote a few months ago, talking up all that was great about Britain during the Olympics, and find some of those positive words in your Thesaurus again now. Do us all a favour and leave the moaning Minnie’s to Twitter. Stick to reminding everyone how BAA and BA are doing what they need to in order to keep our travellers and our guests from around the world safe through this weather disruption and to deliver their customers safely home to their families. This entry was posted in Hyde Park Corner and tagged BAA, BBC, British Airways, British press, London 2012, Olympic spirit, snow, travel by Mayfair Mum. Bookmark the permalink. oh my gosh I so agree with you girlie…plus we can’t react to snow as countries who get it for 6 months or so of the year do because it just wouldn’t be cost effective…so irritating it may be but safety and economic sense prevail! I definitely think BA get a raw deal in the media, especially as the logistics of their operation are on a totally different scale to the budget airlines, who can pick and choose the most profitable routes. I actually sounded just like your Husband when I opened the curtains this morning and saw the overnight snowfall. Luckily I’d booked this week as annual leave so no fraught commute to work for me today. I agree that the news is full of stories about how much chaos there is when the snow causes disruption. However, it’s a journalist’s job to report the facts, not to decide what they can or can’t report because of the impression it creates, for example, of the UK on the world stage. That would lead us into a whole minefield of propaganda. Hi Ellen, I’m all in favour of journalists reporting the facts. I just object to negative spin. I hope BA remember you next time they are giving out reduced tickets. 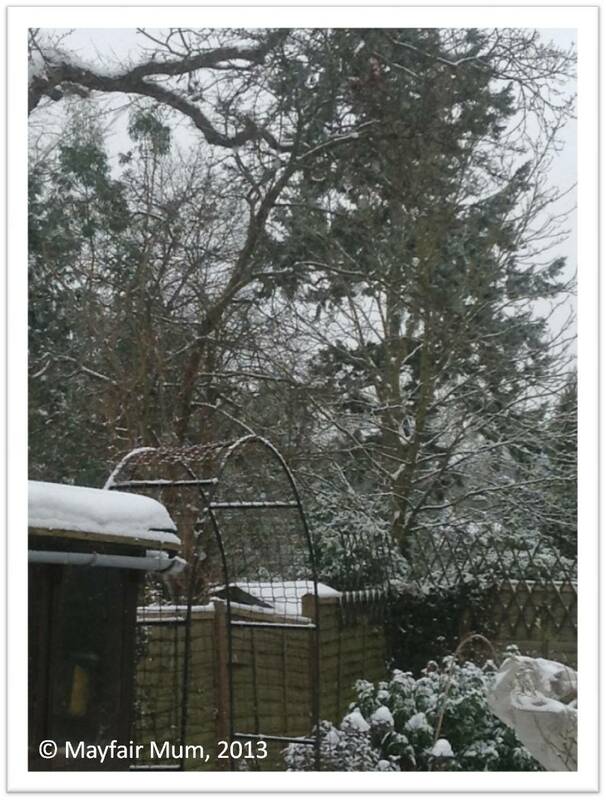 Lovely snowy picture – I always use an iphone for my photos! Ah, I could hug you! My husband works for BA and at snowy times they get such a press..he is on call for snowy times, and has to come in especially to help manage communications. They work very hard at times of bad weather. Lovely to hear someothing positve, MM. Thank you.